Simple house divided into 3 independent apartments. First floor without elevator. It has 3 double bedrooms (1 double bed (135x190cm), 4 single beds (90x190cm)), 1 bathroom with shower, fully renovated and equipped kitchen (gas stove, oven, microwave, dishwasher and washing machine), living-dining room (fireplace, sofa bed) with access to the terrace. Quiet zone. Located in Llafranc. 200m from the beach and 150m from the center of town. Wifi Internet optional (10 euros per week). Large apartment in first line of sea in Llafranc on the first floor without lift. It has 2 double bedrooms (1 double bed (150x190cm) and bunk beds (90x190cm)) and a single room (1 bed of 90x190cm), 2 bathrooms with shower, kitchen (ceramic hob, oven, microwave, washing machine, dishwasher) open to living-dining room (TV), balcony with harbor views. Laundry (washing machine) that communicates with a large furnished terrace with barbecue located on the upper part of the building. Paradis Park, is a simple apartment(40m2), located in Lloret de Mar, in the zone of Fenals, 300m from the beach and 400m from the centre. 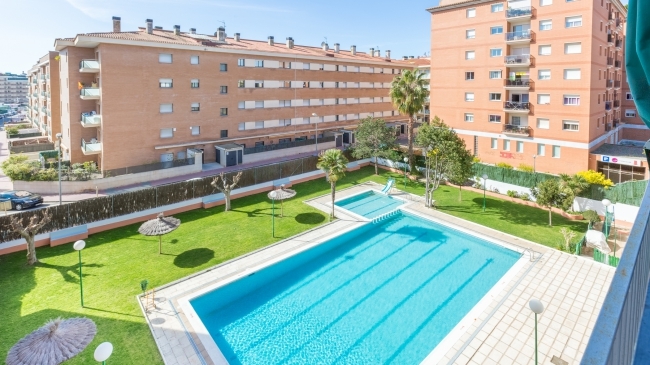 The apartment has a dining room(TV, sofa bed of 80x180cm) with an open kitchen(washing machine, microwave, vitroceramic cooktop),a small balcony with views of the swimming pool. 1 double bedroom with double bed (135x180cm), 1 bathroom with a tub. Elevator. Optional electrical heaters (not included. Extra price for using it: 30 euro/week). Residential area with a nice zone of swimming pool and community gardens. 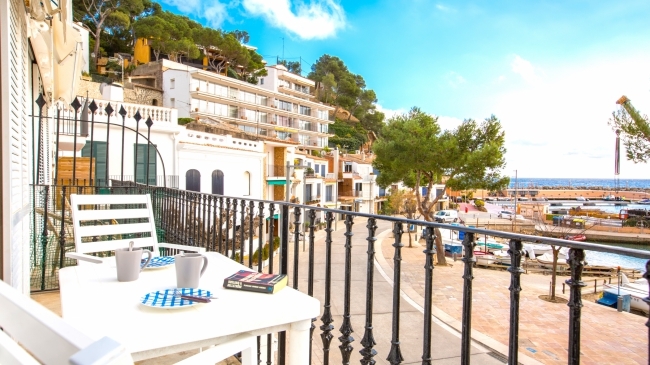 Studio (bungalow) very small and simple (30 m2 including the terrace) located in Calella de Palafrugell, 1km from the town center and 250m from the beach of Golfet. With 1 double bedroom (2 single beds of 80x185cm), sofa-bed (130x190cm) in the dining room, simple kitchen open to the dining room (ceramic hob, microwave), bathroom (shower), terrace (6.80x3.20m). Communal swimming pool. .Community washing machine that works with chips (Cost not included). 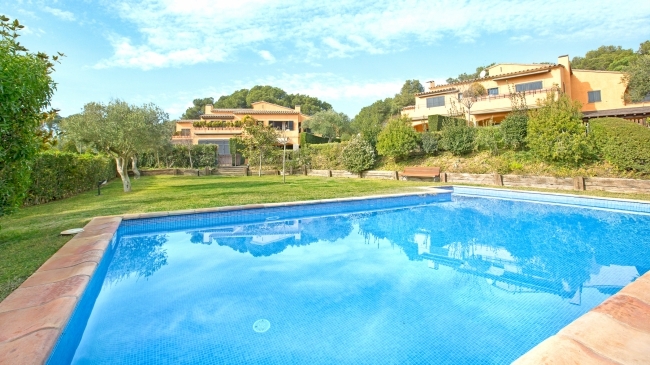 Magnificent house located in Llafranc, just 450m from the beach and the center of town. Located in a residential area with community pool and gardens. The house has 5 rooms (2 rooms with double bed (180x190cm; 135x190cm) one of them en suite with shower and exit to the terrace (overlooking the pool) and the other with balcony; 2 rooms with 2 single beds (90x190cm) one en suite with shower and 1 room with a trundle bed (80x190cm), 2 additional bathrooms (1 with bath and 1 with shower), fully equipped kitchen (ceramic hob, oven, microwave, dishwasher) and laundry (washing machine, dryer), large living room (TV, fireplace) with access to the terrace and private garden (with direct access to the pool). Two furnished porches with barbecue. Quiet area close to the beach. 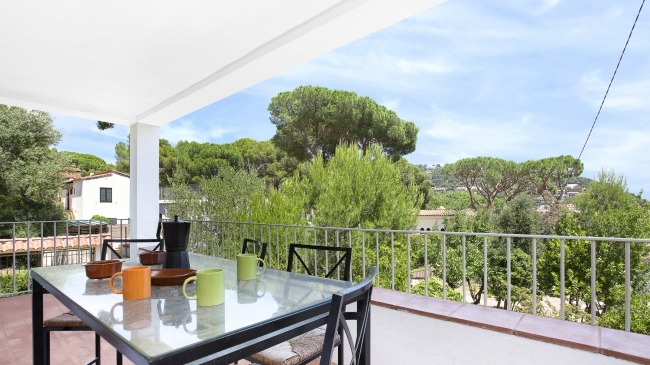 Group of 4 semi-dettached houses in a complex with a shared pool (10 x 5 m) and a garden, located in Llafranc, 500m from the beach and the centre, in a quiet area. Each house (90 m2) has 3 double bedrooms (1 double bed + 4 single beds), a living-room (fireplace, TV -TDT, Hi-fi), kitchen (microwave, dishwasher), 2 bathrooms (1 with bath and one with shower) + 1 toilet, shared washing machine and dryer. Garage. No pets allowed. BBQ forbidden.